Digital nomads aren’t just the hippies of 2018. They are actually redefining what it means to be in the workforce. The term “digital nomad” has been picking up over the last few years. It’s the lifestyle dream of being able to travel the world while getting paid by either freelancing, hopping from gig to gig, or running your own online company. I’ve personally lived on four continents in three years while building my startup before ending up in Silicon Valley. Still, I never saw myself as a digital nomad. I was simply traveling and working remotely for different startups and living in different cities that I was interested in. I wasn’t really hopping from coffee shop to coffee shop or working from a beach in Bali. And honestly, I don’t think this image is a very realistic outlook for the future of work nor is it the goal for most other young, ambitious millennials. Not everybody is cut out for entrepreneurship nor wants to commit to a 2018 version of the hippy lifestyle. Is it possible that what workers really want is the flexibility and freedom that a digital nomad lifestyle offers while still having all the upsides of having a stable job for a company? This doesn’t mean we can’t be a valuable part of the workforce or loyal employees, though. The term “digital nomad” just needs a makeover and get redefined. And that’s exactly what new study by AND CO and Remote Year did, coining the term “Anywhere Workers.” Their study with over 3,700 remote workers gives insight into the new workforce. Remote workers are no longer just self-motivated. Almost a quarter of respondents said their employer’s organization was fully remote. Companies like Invision, Stack Overflow, Toptal, Zapier, and Buffer are leading the way, boasting a fully distributed team. 39.3% of remote workers in the study were employed by global companies. “The new nomads” are less interested in sipping margaritas on the beach in Bali than you might think. While the ability to combine work and travel is certainly a strong plus for lots of remote workers, most of them work from their home countries. Only 9% of the respondents stated that they chose to go remote so they could live the nomad life. The vast majority of respondents stated that freedom and flexibility that the remote lifestyle provides was their main motivator. Less than a quarter of the respondents actually identified as digital nomads. 17% of those travel to 5+ countries a year. According to the study, those who’ve worked remotely for under a year are more likely to have gone remote to combine work & travel (11% vs 6.5% of those who’ve worked remotely for seven years or more). This data suggests that the thrill of traveling the world without a home-base might wear off after the first few months and the average person in 2018 may actually be less nomadic than we might think. 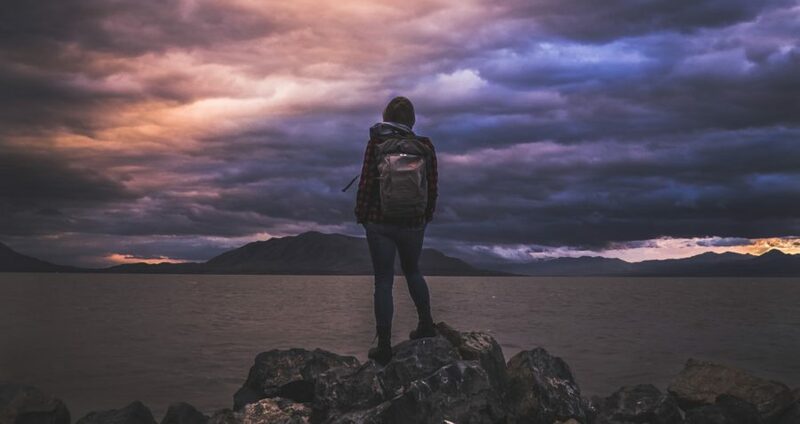 Interestingly, women were slightly more likely to have gone remote so they could ‘live the nomad lifestyle’ (11% vs. 8% male). Say hello to the new rich: the remote white-collar worker that gets paid to travel the world or really just work from anywhere they want to. The top 10% of remote workers has an income of over $100k USD per year. However, if you look closer at the income breakdown, you will see that the vast majority of them makes less than $50k USD per year. This suggests that many of these highly educated individuals may actually not be incentivized by money but would rather accept a smaller paycheck if that buys them their freedom and flexibility. Employers read carefully! This means that you might be able acquire highly skilled remote talent for lower than average salaries. The cash is in the code. Out of all the professionals surveyed, engineers outearn other professions. 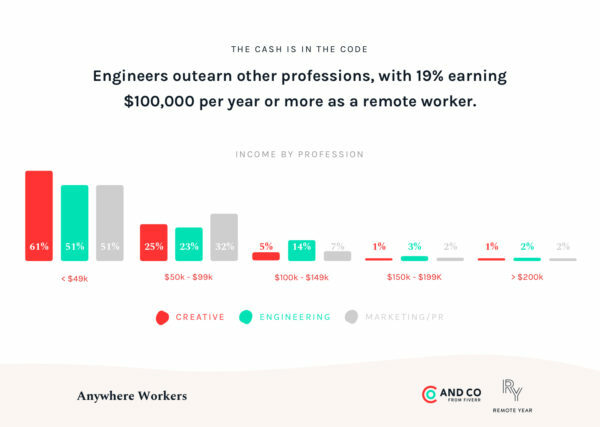 19% of remote engineers earn more than $100,000 USD per year while only 11% of Marketing pros and 8% of Creatives make that kind of money. 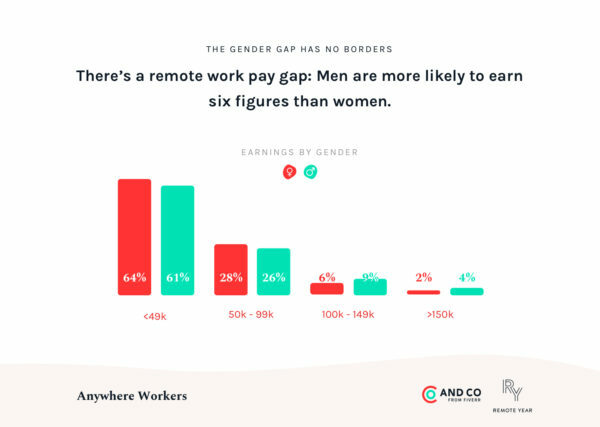 There’s a remote work pay gap: Men are more likely to earn six figures than women (13% vs. 8%). This is partly to do with differences in the industries and professional choices that men and women choose to work in. While 16% of men work in engineering roles, which is the top earning remote profession, only 11% of women state the same. On the other hand, women are more likely to work in Marketing/PR (18.6% vs 11.62% male), which is not one of the top earning remote professions. Forever Anywhere: Anywhere Workers are new to the game… but they are here to stay. The trend of working remotely is relatively new with 73% having gone remote in the last 4 years. Yet, this is not a short-lived trend. Nearly 80% of respondents want to work remotely as long as possible. All of these results together suggest that the typical millennial “digital nomad” may not be what people think it is. The remote workers are growing up and painting a more realistic picture of what the future of the workforce will truly look like. The workforce of tomorrow will consist of anywhere workers rather than digital nomads: they don’t want to flee to white sandy beaches and run online businesses while sipping margaritas at the beach in Bali…but they want to know that they could… if they wanted to.